Maybe you know a bit but want to know more? Not sure you’re doing things the ‘textbook’ way? Learn to fix brakes and gears, and keep your bike in peak condition, supporting a local charity at the same time. Life Cycle’s one-day bike maintenance courses are ’empowering, fascinating and fun’. 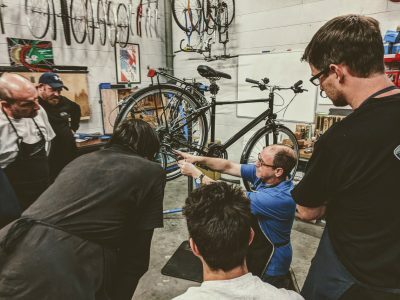 You’ll be working with a qualified cycle mechanic in our professional bike workshop, using brand new tools and work stands. The class sizes are small (maximum six) and courses are taught methodically with plenty of time to practise. By the end of the day you’ll have complete confidence to fix common mechanical issues; you’ll leave feeling inspired to get cracking on your next project. It’s a great way to spend a rainy Saturday! The next course will take place on 2 March, 10:00–16:00, in Horfield. One-day course fees are £75. Find out more at https://www.lifecycleuk.org.uk/bike-maintenance-improvers and follow the Course Format link for 2 March to book your place.